Um, ok. I finished watching the entire series The Wire this past weekend. I binge-watched the last 2.5 seasons or so, but watched the entire series beginning to end over the last 6 months. The last 2.5 seasons were watched over about a 2 week span. It’s fresh in my mind. I didn’t watch the Wire when it was on HBO a decade ago. 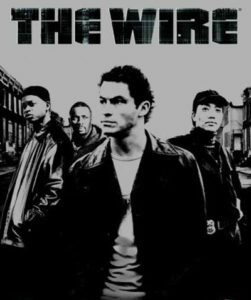 I have always read, in all my pop culture and entertainment reading and podcast listening, that the Wire was incredible and woefully under appreciated in modern entertainment culture. I heard and read references to Omar, and Bubbles, and Stringer Bell, and Bunk, and McNulty, and Prop Joe, never really understanding what those references meant. The references, however, were always made consistently in the tones of awe, amazement and reverence. I didn’t understand because I had never watched it. I know, I know. You haven’t watched it, and this statement seems ridiculous. I am here to shout from the rooftops that everyone in America needs to watch The Wire. EVERYONE, EVERYWHERE. You are right to be skeptical. I absolutely support and encourage your skepticism. I will attempt to provide you with a rationale to investigate and evaluate it for yourself, and convince you why it warrants a Constitutional amendment requiring every adult in America to watch it. The efficiency and effectiveness of its storytelling over 5 seasons is breathtaking. It follows a group of police officers in Baltimore from Season 1 all the way thru Season 5, weaving tales of drugs, politics, city management, blue collar workers, schools and newspapers in and around the core group. The show examines each of these areas of modern American life, not in a rote or check the box, I need to comment on this way, but in truly elegant organic storytelling. Honestly, I would call it Homeric. What do I mean by that? Homeric in the sense that the tale is a compelling story, in and of its own right, with characters and plot that are beyond interesting, always engaging the viewer, and demanding attention at all times. And at the same time, every moment is a deep examination of modern American city life, its culture, pressures, power, and humanity. It’s a tale of us, a cultural touchstone for all time. The show never loses sight of the humans at the center of it. Lots of shows want to be commentaries on, …name your Big Idea. Politics, or Power, or Crime. The humans in those shows are simply vehicles to move around to tell the big tale, or vessels from which flow Important Statements. And note that it is not until late here that I mention race and race relations. The racism in the show isn’t one of the things it wants to overtly Comment on. The racism is simply a given. Of course the show is commenting on it, but the racism is not treated as a separate thing to be examined, dissected, and disapproved of. The racism, from everyone, is treated as an immutable part of everything that all the characters say and do. The show’s genius is found in its ability to depict the unconscious (and conscious) bias and racism in all the characters, without putting neon on it. And yet, every human watching gets it. What the makers of the Wire mastered is grounding all that commentary in real humans, making real decisions, from which emerges the devastating view on all those big things other shows try to shout about. Every character evolves. Some evolve in the direction of extinction (real or metaphorically) and some evolve toward some version of success. I am still shaking my head at how they managed to sustain it over 5 seasons, with threads in every season stitching all the central characters together to create a tapestry of hope, love, faith, despair, frailty, chance, pragmatism and outright venality. Humans encompass all of those things. The Wire depicts it all almost perfectly. It is a stunning artistic achievement. Add it to your bucket list of life, watch it, think about it, discuss it, and share it. It is transformative art. This entry was posted in SEEN and tagged The Wire on February 5, 2017 by BrothersGeekadmin. 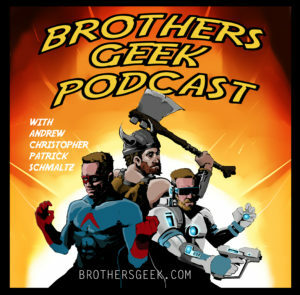 Ever wondered if three adult males can talk for 30 minutes about the title of a movie? We answer that question and it’s a “yes”. We discuss the reveal of the new Star Wars movie title “The Last Jedi”. We debut our Re-Watch segment with “the Ghost in the Shell” (anime). It prompts all kinds of questions about consciousness, humanity and nature of self. On the suggestion of a Loyal Listener, we debate what is the greatest fighting game of all time. Andrew yells “Hadouken” more than is necessary. We, of course, talk about all the things we saw, read, and played. And even talk a little soccer while we are at it.Trivia is “The Expanse” themed and it is too easy. This entry was posted in Podcasts and tagged Ghost in the Shell, Star Wars The Last Jedi, The Expanse, The Last Jedi on February 2, 2017 by BrothersGeekadmin.